Previous postMy very first vlog! I also have front loading washer and dryer. Mine are on pedestals and I have a much less painful time using them than the top loading washer I used to have. Even though it takes up a lot of space, I leave my ironing board up all the time. I realized I would never use it when it was folded up because of the hassle of getting it set up. If I didn’t have a toddler that would pull it down I would leave it up too! I hate dealing with the ironing board! Love how you made the most of an otherwise unusable space. Very nice! Love the post! I also love the idea of the whole saving spoons concept for your blog posts. When we first purchased our house ten years ago our washer and dryer were out in the garage. This lead to many socks being rewashed after being dropped during the washer to dryer transfer and no one wanting to do laundry during the winter months (New England winters = icebox garage). This lasted about a year. Then, in the interest of effiiency, we took an underutilized room on the first floor of the house and turned it into a laundry room. This is one of the smartest renovations we did to the house and this was even before I got sick! We now have a short trip between the bedroom, bathrooms and the laundry. We know when the machines are done and don’t have to carry a kitchen timer around and hubby added sound baffling insulation into the walls so you really can’t hear the machines. Plus the new front loaders I bought are even quieter! I often don’t even know they are running. My friend who has fibro is going to do the same thing to her house. She loves the idea of having the laudry on the first floor instead of in the basement. Way less stairs involved on laundry day. At our previous apartment the laundry was in a separate building so it was such a pain! So I was so excited to finally have a laundry room and not have to go outdoors to do laundry (which is awful in rain or winter!). My mom now has arthritis so I’m trying to convince her to move her W&D upstairs (instead of the basement) for the sake of her knees! Cute, cute! Love the saving spoons idea and am jealous (not really, more envious I would say,) of your front loaders! Because I am such an avid recycler (mmmhhmmm.. cheap) I am making sure to get the whole life out of mine before I trade them in for a new model. At least I know they are energy efficient, just not human efficient-ha! This looks great! You have done a great job of what you have. I don’t have a laundry room yet, sigh. We just have a small space next to our kitchen that fits our washer and dryer. I hung up a pull up bar (my Hubby ended up not wanting it for his workouts) and that works as our bar to hang clothes to dry. I can’t WAIT to have a real laundry room! We’ve never had a real laundry room before either so it was a real bonus when we bought our house! We did that for 3 years before buying our house! And living in a college town, it meant sharing a laundry room with college kids who weren’t always the most respectful of others’ things! I’m so glad those days are over! Hopefully it won’t be long for you either! I actually don’t know that I could survive without my laundry sorter. Between my husbands work/dress clothes, my son’s soccer gear, and all the other laundry- sheesh. 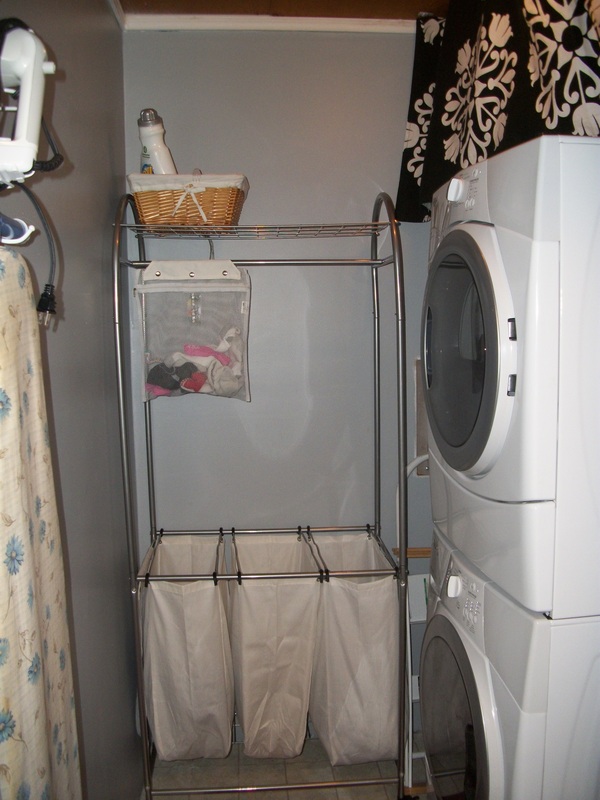 Such a great-looking laundry space you made! !